Louis VI (1 December 1081 – 1 August 1137), called the Fat (French: le Gros), was King of the Franks from 1108 until his death (1137). Chronicles called him "roi de Saint-Denis". Louis was the first member of the House of Capet to make a lasting contribution to the centralizing institutions of royal power, He spent almost all of his twenty-nine-year reign fighting either the "robber barons" who plagued Paris or the Norman kings of England for their continental possession of Normandy. Nonetheless, Louis VI managed to reinforce his power considerably and became one of the first strong kings of France since the division of the Carolingian Empire in 843. Louis was born on 1 December 1081 in Paris, the son of Philip I and his first wife, Bertha of Holland. Suger tells us: "In his youth, growing courage matured his spirit with youthful vigour, making him bored with hunting and the boyish games with which others of his age used to enjoy themselves and forget the pursuit of arms." And..."How valiant he was in youth, and with what energy he repelled the king of the English, William Rufus, when he attacked Louis' inherited kingdom." Louis married Lucienne de Rochefort, a French crown princess, in 1104, but repudiated her three years later. They had no children. On 3 August 1115 Louis married Adelaide of Maurienne, daughter of Humbert II of Savoy and Gisela of Burgundy, and niece of Pope Callixtus II. They had eight children. Adelaide was one of the most politically active of all France's medieval queens. Her name appears on 45 royal charters from the reign of Louis VI. During her tenure as queen, royal charters were dated with both her regnal year and that of the king. 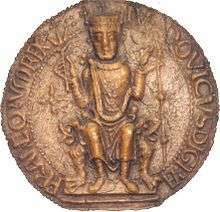 Suger became Louis's adviser before he became king and he succeeded his father at the age of 26 on 29 July 1108. Louis's half-brother prevented him from reaching Rheims, and so Daimbert, Archbishop of Sens, crowned him in the cathedral of Orléans on 3 August. Ralph the Green, Archbishop of Rheims, sent envoys to challenge the validity of the coronation and anointing, but to no avail. The crowning of Louis VI in Orléans. When Louis ascended the throne the Kingdom of France was a collection of feudal principalities. 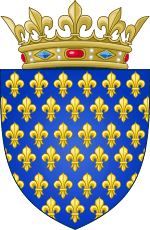 Beyond the Isle de France the French Kings had little authority over the great Dukes and Counts of the realm but slowly Louis began to change this and assert Capetian rights. This process would take two centuries to complete but began in the reign of Louis VI. The second great challenge facing Louis was to counter the rising power of the Anglo-Normans under their capable new King, Henry I of England. From early in his reign (and during his father's reign) Louis faced the problem of the robber barons who resisted the King's authority and engaged in brigandry, making the area around Paris unsafe. From their castles, such as Le Puiset, Chateaufort, and Montlhery, these barons would charge tolls, waylay merchants and pilgrims, terrorize the peasantry and loot churches and abbeys, the latter deeds drawing the ire of the writers of the day, who were mostly clerics. In 1108, soon after he ascended the throne, Louis engaged in war with Hugh of Crecy, who was plaguing the countryside and had captured Eudes, Count of Corbeil, and imprisoned him at La Ferte-Alais. Louis besieged that fortress to free Eudes. In early 1109, Louis besieged his half-brother, Philip, the son of Bertrade de Montfort, who was involved in brigandry and conspiracies against the King, at Mantes-la-Jolie. Philip's plots included the lords of Montfort-l'Amaury. Amaury III of Montfort held many castles which, when linked together, formed a continuous barrier between Louis and vast swathes of his domains, threatening all communication south of Paris. In 1108-1109 a seigneur named Aymon Vaire-Vache seized the lordship of Bourbon from his nephew, Archambaud, a minor. Louis demanded the boy be restored to his rights but Aymon refused the summons. Louis raised his army and besieged Aymon at his castle at Germigny-sur-l'Aubois, forcing its surrender and enforcing the rights of Archambaud. In 1122, Aimeri, Bishop of Clermont, appealed to Louis after William VI, Count of Auvergne, had driven him from his episcopal town. When William refused Louis' summons, Louis raised an army at Bourges, and marched into Auvergne, supported by some of his leading vassals, such as the Counts of Anjou, Brittany, and Nevers. Louis seized the fortress of Pont-du-Chateau on the Allier, then attacked Clermont, which William was forced to abandon. Aimeri was restored. Four years later William rebelled again and Louis, though his increasing weight made campaigning difficult, marched again. He burned Montferrand and seized Clermont a second time, captured William, and brought him before the court at Orleans to answer for his crimes. Some of the outlaws became notorious for their cruelty, the most notable being Thomas, Lord of Coucy, who was reputed to indulge in torture of his victims, including hanging men by their testicles, cutting out eyes, and chopping off feet. Guibert of Nogent noted of him, "No one can imagine the number of those who perished in his dungeons, from starvation, from torture, from filth." Another notable brigand was Hugh, Lord of Le Puiset, who was ravaging the lands around Chartres. In March 1111, Louis heard charges against Hugh at his court at Melun from Theobald II, Count of Champagne, the Archbishop of Sens, and also from bishops and abbots. Louis commanded Hugh to appear before him to answer these charges, but Hugh evaded the summons. Louis stripped him of his lands and titles and laid siege to Le Puiset. After a fierce struggle, Louis took the castle and burned it to the ground, taking Hugh prisoner. Rashly, Louis released Hugh, and while Louis was engaged in war with Henry I of England and Theobald, Hugh raised another band of brigands and began ravaging the country again. When Louis returned his attention to Hugh, he found Le Puiset rebuilt and Hugh receiving aid from Theobald. Hugh held out against the King until Theobald abandoned him. Once again Louis razed Le Puiset and Hugh, who had sworn never to return to his brigandage, rebuilt the castle and resumed terrorizing his neighbours. At the third attempt, Louis finally defeated Hugh and stripped him of his possessions for the last time. Hugh later died on an expiatory pilgrimage to the Holy Land. These were just some of the recalcitrant nobles Louis was forced to contend with. There were many more, and Louis was in constant motion against them, leading his army from castle to castle, bringing law and order to his domains. The result was increased recognition of the King's authority and the Crown's ability to impose its will, so that all sectors of French society began to see the King as their protector. 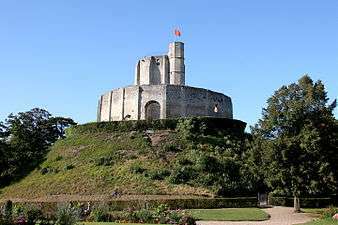 After seizing the English Crown, Henry I of England deprived his brother, Robert Curthose, of the Duchy of Normandy and quickly took possession of the castle at Gisors, a fortress of strategic importance on the right bank of the Epte, commanding the road between Rouen and Paris. This violated an earlier agreement between Henry and the French King that Gisors should remain in the hands of a neutral castellan, or else be demolished. This move threatened the Capetian domain and Louis was outraged, demanding Henry, as his vassal, appear before him to account for his actions. The two kings met, in force, in March 1109 at the borders of their respective territories at the bridge of Neauphle on the Epte. Henry refused to relinquish Gisors. Louis challenged the English King to single combat to settle the issue. When Henry refused, war was inevitable, a war which would last, on and off, for twenty years. The first years of the war went well for Louis until the influential Theobald II, Count of Champagne, switched to Henry's side. By early 1112 Theobald had succeeded in bringing together a coalition of barons with grievances against Louis: Lancelin of Bulles, Ralph of Beaugency, Milo of Bray-sur-Seine, Hugh of Crecy, Guy of Rochfort, Hugh of Le Puiset and Hugh, Count of Troyes. Louis defeated Theobald's coalition but the additional effort meant he could not defeat the English monarch as well or force him to abandon Gisors, and in March 1113 Louis was forced to sign a treaty recognizing Henry I as suzerain of Brittany and Maine. Peace of sorts lasted three years until April 1116 when hostilities renewed in the French and Norman Vexins, with each king making gains from his rival. By 1119, buoyed by several successes and the capture (through treachery) of Les Andelys, Louis felt ready for a final encounter to end the war. In the fierce Battle of Bremule, in August 1119, Louis's troops broke and routed, abandoning the royal banner and sweeping the King along with them in retreat to Les Andelys. A counter-attack through Evreaux to seize Breteuil failed and Louis, health failing, looked for peace. He appealed to Pope Calixtus II, who agreed to help and met with Henry at Gisors in November 1120. The terms of the peace included Henry's heir, William Adelin, doing homage to Louis for Normandy, a return of all territories captured by both kings with the painful exception of Gisors itself, which Louis was forced to concede to Henry. Statue of Blessed Charles the Good in the Basilica of the Holy Blood, Bruges. On 2 March 1127, the Count of Flanders, Charles the Good, was assassinated in St. Donatian's Cathedral at Bruges. It was a scandal in itself but made worse because Charles had no heir. Soon a variety of claimants were abroad, including William of Ypres, son of Charles's uncle and popularly thought to be complicit in the murder, Thierry of Alsace, the son of Gertrude of Flanders, Duchess of Lorraine, Arnold of Denmark, nephew of Charles the Good, who seized Saint-Omer. Baldwin, Count of Hainault, who seized Oudenarde, and Godfrey I, Count of Louvain and Duke of Brabant. Louis had his own candidate in mind and marched into Flanders with an army and urged the barons to elect William Clito, son of Robert Curthose, who had been disinherited of Normandy by his uncle Henry I of England, as their new Count. He had no better claim to Flanders than being the King's candidate but on 23 March 1127 he was elected Count by the Flemings. Louis then moved decisively to secure Flanders, apprehending the murderers of Charles the Good and ousting the rival claimants. On 2 April he took Ghent, on 5 April Bruges, on 26 April he took Ypres, capturing William of Ypres and imprisoning him at Lille. He then quickly took Aire, Cassel and all the towns still loyal to William of Ypres. Louis's final act before leaving for France was to witness the execution of Charles the Good's murderers. They were hurled from the roof of the church of Saint Donatian where they had committed their crime. It was a triumph for Louis and demonstrated how far the Crown had come under his leadership, but it was a brief triumph. The new young Count William Clito fared badly, relying on heavy handed feudal ways not suited to the more socially advanced and mercantile Flemings. William's knights ran amok and the Flemings rebelled against Louis's candidate. Ghent and Bruge appealed to Thierry of Alsace and Saint-Omer to Arnold of Denmark. Louis attempted to intervene again but the moment was gone. The people of Bruge rejected him and recognized Thierry of Alsace as their Count, and he quickly moved to enforce his claim. Louis called a great assembly at Arras and had Thierry excommunicated but it was a gesture. Louis abandoned William of Clito, who died during a siege at Alost on 27 July 1128, and after the whole country finally submitted to Thierry, Louis was obliged to confirm his claim. Henry V, Holy Roman Emperor, with Ruthard, Archbishop of Mainz. Paint on vellum. Parker Library, Corpus Christi College, Cambridge. On 25 November 1120, Louis' fortunes against Henry I of England were raised when Henry's heir, William Adelin, drunkenly perished aboard the White Ship en route from Normandy to England, putting the future of Henry's dynasty and his position in doubt. By 1123 Louis was involved with a coalition of Norman and French seigneurs opposed to Henry. The plan was to drive the English King from Normandy and replace him with William Clito. Henry, however, easily defeated this coalition then instigated his son-in-law, Henry V, Holy Roman Emperor, to invade France. Henry V had married the Empress Matilda, the English King's daughter and the future mother of Henry II of England, 9 years earlier, in hopes of creating an Anglo-German empire, though the couple remained childless. Like Louis, Henry V had designs on the Low Countries and an invasion of Northern France would enable him to strengthen his ambitions in Flanders, as well as support his father-in-law. Thus in 1124, Henry V assembled an army to march on Rheims. It never arrived. In testament to how far Louis had risen as national protector, all of France rose to his appeal against the threat. Henry V was unwilling to see the French barons united behind their King, who now identified himself as the vassal of St Denis, the patron saint of Paris, whose banner he now carried, and the proposed invasion was abandoned. Henry V died a year after the aborted campaign. In 1128 Henry I married his sole surviving legitimate child, the dowager Empress Matilda, to Geoffrey Plantagenet, Count of Anjou. This was a very dangerous alliance for Louis and would prove so during the reign of his successor, Louis VII of France. As Louis VI approached his end, there seemed to be reasons for optimism. Henry I of England had died on 1 December 1135 and Stephen of Blois had seized the English crown, reneging on the oath he had sworn to Henry I to support Matilda. Stephen was thus in no position to bring the combined Anglo-Norman might against the French crown. Louis had also made great strides in exercising his royal authority over his barons, and even Theobald II had finally rallied to the Capetian cause. Finally, on 9 April 1137, a dying William X, Duke of Aquitaine appointed Louis VI guardian of his fifteen-year-old daughter and heiress, Eleanor of Aquitaine. 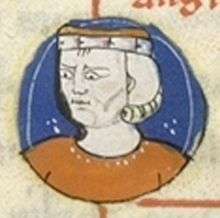 Eleanor was suddenly the most eligible heiress in Europe, and Louis wasted no time in marrying her to his own heir, the future Louis VII, at the Cathedral of Saint-André in Bordeaux on 25 July 1137. At a stroke Louis had added one of the most powerful duchies in France to the Capetian domains. Louis died of dysentry 7 days later, on 1 August 1137. Despite his achievements, it would be the growing power of the soon to be Angevin Empire that would come to overshadow his successor, its seeds sown in the marriage between the Empress Matilda and Geoffrey Plantagenet and realised through their son, Henry II of England. Louis VI was interred in the Basilica of St Denis in Paris. 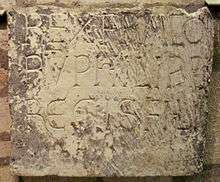 Epitaph of Louis VI, after 1137, Eglise Abbatiale de Saint Denis, today at Cluny Museum. He married in 1104: 1) Lucienne de Rochefort — the marriage was annulled on 23 May 1107 at the Council of Troyes by Pope Paschal II. Philip (29 August 1116 – 13 October 1131), King of France (1129–31), not to be confused with his brother of the same name; he died as a result of a fall from a horse. Louis VII (1120 – 18 September 1180), King of France. Henry (1121 – 13 November 1175), Archbishop of Reims. Hugues (ca 1122 – died young). Robert (ca 1123 – 11 October 1188), count of Dreux. Peter (September 1126 – 10 April 1183), married Elizabeth, Lady of Courtenay. Constance (ca 1128 – 16 August 1176), married first Eustace IV, count of Boulogne, and then Raymond V of Toulouse. Philip (ca 1132/33 -1161), Archdeacon of Paris, not to be confused with his elder brother. Isabelle (ca 1105 – before 1175), married (ca. 1119) Guillaume I of Chaumont in 1117. ↑ Norman F. Cantor, The Civilization of the Middle Ages 1993, p 410. ↑ "Government, law and society", R. van Caenegem, The Cambridge History of Medieval Political Thought C.350-c.1450, ed. J. H. Burns, (Cambridge University Press, 1988), 188. ↑ "The Kingdom of the Frank to 1108", Constance Brittain Bouchard, The New Cambridge Medieval History, Vol. 4, Part II, ed. David Luscombe, Jonathan Riley-Smith, (Cambridge University Press, 2004), 126. ↑ Abbot Suger: Life of King Louis the Fat, Chapter 1. 1 2 "The Historia Iherosolimitana of Robert the Monk and the Coronation of Louis VI", James Naus, Writing the Early Crusades: Text, Transmission and Memory, ed. Marcus Bull, Damien Kempf, (Boydell Press, 2014), 112. 1 2 3 "France: Louis VI and Louis VII (1108-1180)", Louis Halphen, The Cambridge Medieval History: Contest of Empire and Papacy, Volume V, ed. J.R. Tanner, C.W. Previte-Orton, and Z.N. Brooke. The Macmillan Company, 1926. p. 596. 1 2 Robert Fawtier, The Capetian Kings of France, transl. Lionel Butler and R.J. Adam, (Macmillan, 1989), 21. 1 2 Jim Bradbury, The Capetians: kings of France, 987-1328, 132. ↑ Ann Marie Rasmussen, Mothers and Daughters in Medieval German Literature, (Syracuse University Press, 1997), 9. ↑ Isabella of Angouleme: John's Jezebel, Nicholas Vincent, King John: New Interpretations, ed. S. D. Church, (The Boydell Press, 1999), 202. ↑ (FR) Jean Dufour, "Un Faux de Louis VI Relatif a Liancourt (Oise)", Bibliotheque de L'Ecole des Chartes Revue D'Erudition, January–June 1986: 46. ↑ Robert Fawtier, The Capetian Kings of France:Monarchy and Nation 987-1328, transl. Lionel Butler and R.J. Adam, (Macmillan Education Ltd, 1989), 19.